By disinfecting water at the main point of entry to your home or business, this solution ensures safe, great tasting water from every tap. Moreover, you can rest easy knowing that each shower head, bath faucet and other water points-of-use within the building receive the same cleansing and disinfection. These completely integrated systems use sediment and carbon filters combined with our revolutionary TROJAN ultraviolet reactor to provide water that is free of harmful bacteria. An economical way to receive safe, great tasting water from a single tap, these systems are typically installed beneath a sink and will provide the same cleansing and disinfection as our larger point-of-entry solutions. 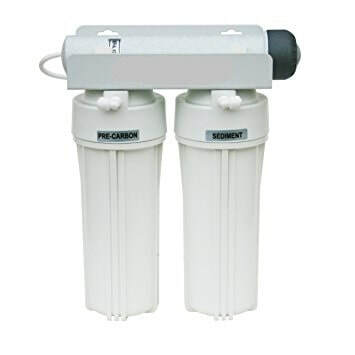 These completely integrated systems use sediment and carbon filters combined with ultraviolet treatment to provide water that is free of harmful bacteria. Capable with higher volume flow rates, these systems are designed specifically for commercial and industrial applications. 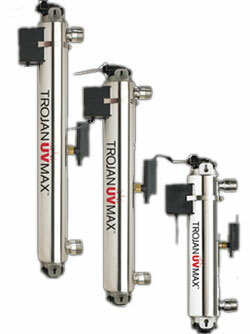 Our TROJAN UV Max Pro Series delivers sanitized, safe drinking water throughout a company, resort hotel or other commercial enterprise. ECOSERVE is available to create a customized solution to meet your system and service needs. These systems use sediment and carbon filters combined with our revolutionary TROJAN ultraviolet reactor to provide water that is free of harmful bacteria. Hard scale build-up is a problem affecting pipes, appliances, windows, and virtually anything water regularly touches in your home. Water softeners are the time-tested solution for eliminating hard minerals from your plumbing systems and appliances. We provide softening solutions for many application sizes as well as salt for ongoing system maintenance. Our BPA-free water pitchers hold a half gallon of water and produce approximately 150 gallons of 99.99% contaminant free water per filter. This proven technology filters out chlorine, flouride, heavy metals, chemicals, odors, sediment, etc. Traditional single speed pool pumps require a hefty 1,600-2,000 watts of power and are very expensive to operate. Variable speed pumps include complicated programming controllers that are expensive and unreliable. The ECO Pump has no on board electronic circuits making is simple, reliable and efficient. The SolarPur floating ionization product generates a charge from the solar panel on the surface which releases mineral ions into your pool water. These ions stop algae and other bacterial growth, reducing drastically the amount of chemicals you need to use and improving water clarity.